A broadside commemorating the first anniversary of Sims’ seizure. went so far as to put a nominal price on Simms’ mother and children that they might be enabled, through friends, to purchase their freedom, which they did. That particular kindness did not extend to Thomas. His training as a mason made him too valuable to just let go. Potter set a price of $1,800. Sims said he could find a man with $1,800 if Potter would let him look. Potter refused. Some time thereafter, Potter planned a trip to New York. Sims suggested that he might see Potter there, which says something about their relationship. A slave openly talking about running away with his owner, even as a joke, would probably not fly very often. Potter owned 103 slaves and so must have faced all the pressures to keep a tight lid on any sort of dissension among his human property, but he let that one go. Sims stowed away on his boat and soon arrived in Boston, where he got a job as a waiter. Potter tracked him down and called on the local authorities to do their duty under the Fugitive Slave Law. 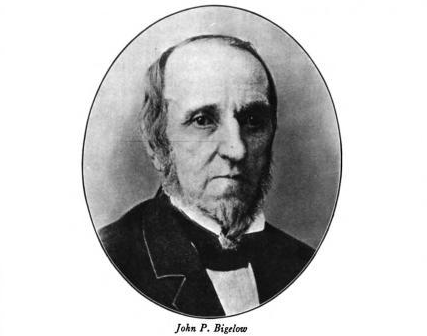 This put Boston’s Whig mayor, John P. Bigelow on the spot. He did not provide help in the form of Boston police to secure Shadrach Minkins and his inaction brought him criticism from the slave catchers, Millard Fillmore, and Daniel Webster. Determined not to face the wrath of his party again, Bigelow allowed the federal marshals to deputize his police to arrest Sims. They did so and took Sims on April 4, 1851. Remembering the storming of the courthouse to free Shadrach, the police locked it tight with a heavy chain and, joined by a detachment of soldiers, put it under guard. With violence out of the question in the face of such armed opposition, Boston’s abolitionists had only legal maneuvers at their disposal. The usual flurry of paper, and corresponding protest meetings, ensued to no avail. On April 11, after a trial, 300 police and soldiers packed Thomas Sims off to the naval yard, where 250 soldiers stood ready to ship him back to Georgia. Sims returned to Savannah and in short order found himself on the auction block in Charleston. Sale brought him to New Orleans and then Vicksburg. There Sims eventually found himself again with the army, this time of his own choosing. He bolted to the Union lines and returned to Boston on a pass bearing Ulysses S. Grant’s signature. He arrived in time to see the 54th Massachusetts, the first black regiment recruited in the North, presented its colors. But as far as anyone knew at the time, Thomas Sims went South for good. His case represents the inverse of Shadrach Minkins’ both in the immediate outcome and larger political context. Boston abolitionists reached new heights in keeping Shadrach free, sparking alarm and outrage in proslavery, pro-compromise quarters. 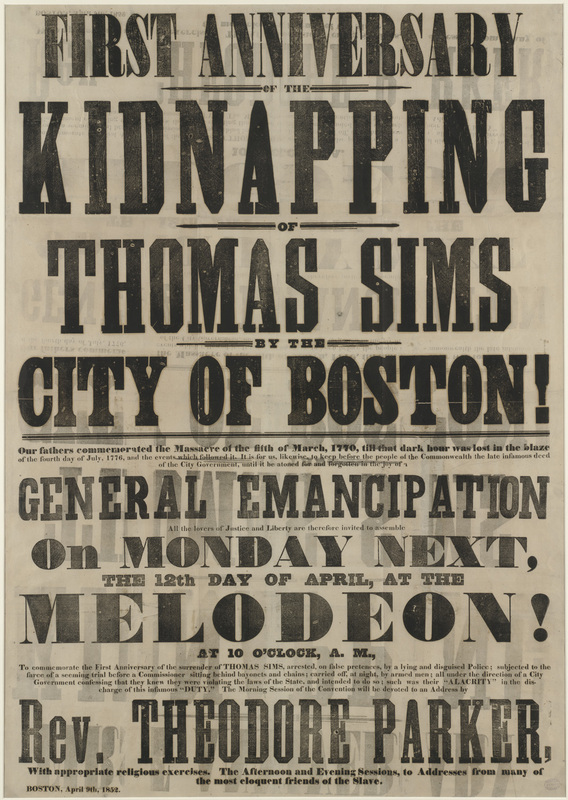 Thomas Sims saw the state reach new heights in enforcing the new fugitive slave law: hundreds of soldiers and police armed and ready to fight back against the abolitionists who themselves fought back only months before. The only way to make the Fugitive Slave Law a dead letter is to make half a dozen or more dead kidnappers. […] A half dozen more dead kidnappers carried down South would cool the ardor of Southern gentlemen, and keep their rapacity in check. To Southern eyes, that must have read as no less than a call for race war. So far, nobody had died. How long could that last? This entry was posted in Road to War and tagged Compromise of 1850, Frederick Douglass, Fugitive Slave Act, fugitive slaves, The North.